I’ve always been one of those people who didn’t quite understand take-and-bake pizza. Why the heck would I want to order a pizza ten go home and still have to cook it? I mean, there’s not that much of a price difference. Earlier this week, we got a coupon book in the mail for Papa Murphy’s. There were some pretty good deals, so I asked J if she’d want to give it a try. I figured we could spend Saturday night cuddled up on the couch watching a movie and eating pizza. Sounds like a pretty good night, eh? We headed down to Walgreens to rent Julie & Julia from Redbox. I’ve become a huge fan of Redbox in the last few months. Up until this past summer, I was a Netflix subscriber. Before J and I started dating, I watched three or four movies a weekend. I’m a sucker for the classics. J, not so much. Since she didn’t want to watch Fred Astaire and Ginger Rogers or Humphrey Bogart and Lauren Bacall, I didn’t force her, but it also made my Netflix a waste of money. I stopped and now we just go to Redbox and rent a new release when we’re in the mood for movie night. 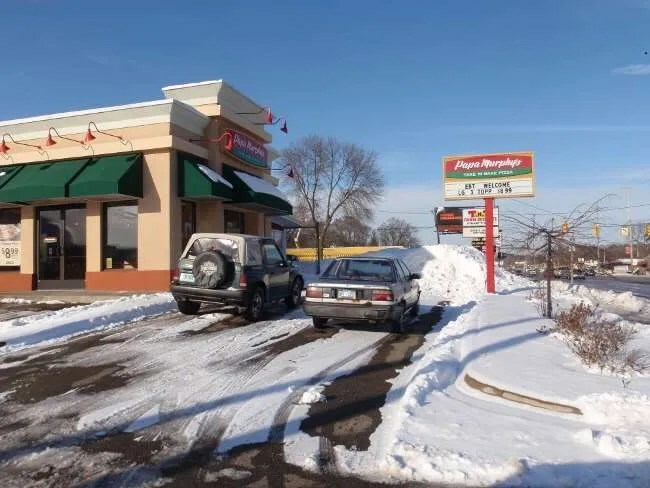 After picking up the movie, we headed back down Westnedge to Papa Muprhy’s which is Denway Drive across the street from Mt. Ever-Rest Memorial Park. Neither of us had ever been in a Papa Murphy’s before so we had no idea what to expect. The only other time I had done a take-and-bake was in Peoria at a place called Nick & Willy’s. They would actually cook it for you if you wanted and they had sandwiches and lunch options on their menu, so it was more of a little restaurant. Papa Murphy’s reminds me of a sub shop. There’s a cashier to your left when you walk in. You put your order in there then he hands it to the pizza makers. The pizza’s are made right in front of you after you order them. They have a little assembly line like operation. We weren’t the only ones in the mood for pizza tonight. There were four or five people in line in front of us and the cashier was taking a pretty long call-in order when we got there. When it finally got to be our turn, I handed the cashier the coupon that we decided to use. We got two deLite pepperoni pizzas for $10.99. Regularly, these pizzas go for $7.99, so it’s about half off one. The deLite pizza is a thin crust pizza that Papa Murphy’s bills as having 40% fewer calories and 30% less fat. That wasn’t the reason we chose it. We just like thin crust pizza. The dough is already stretched out on to a paper baking sheet. The pizza makers just grab them out of the freezer and take the plastic wrap off. They are then loaded up with sauce, mozzarella cheese, pepperoni, then topped off with a cheddar/mozzarella mix. J’s not a big pepperoni fan, so as the pizza was being made, she asked if they could leave pepperoni’s off half of one of the pizzas. 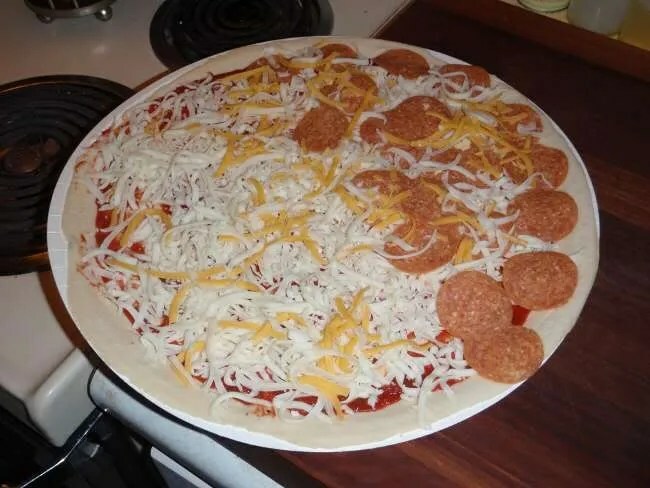 Since the pizza was not being cooked there, we could also take it home and move the pepperoni around, so we could make one half a pepperoni lovers and one half plain cheese. After the pizzas are put together, they are wrapped in plastic wrap with cooking instructions then handed over to us to take home and throw in the oven. The instructions say the pizza should either be cooked or refrigerated within 60 minutes of it being made and if refrigerated, cooked within 24 hours. 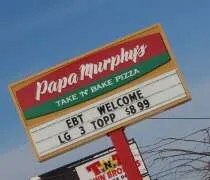 I thought about freezing one, but I Google searched freezing Papa Murphy’s pizza and no one recommended it. When it was time for the movie, I turned the oven on to 425 degrees and waited for it to preheat. I took one of the pizzas out of the fridge and unwrapped it. The pizzas come on a paper baking sheet that you put into the oven. The recommended time for cooking is 12-18 minutes, but after ten, the pizzas were well-done and golden brown. Just how we like it. The deLite pizza has a super thin crust. 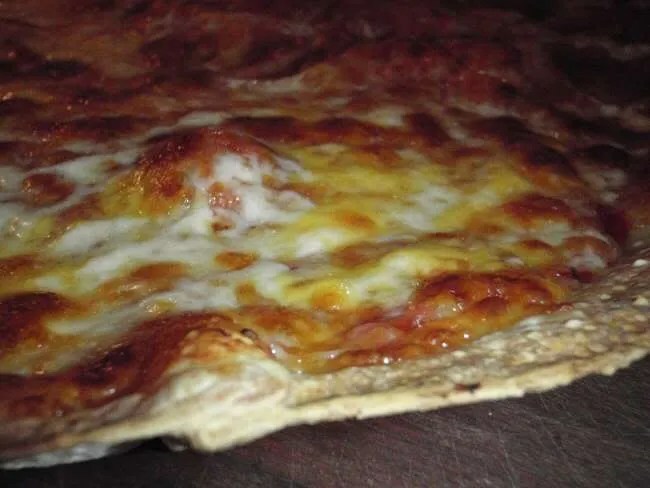 I mean, super thin crust. We both loved it. Neither of us had any idea what to expect and it turns out, it’s some of the best take-out pizza we’ve had. My biggest complain with chain pizza places is that all of the pizzas are exactly the same. They have the same crust. Same cheese. Same flavor. Papa Murphy’s is something completely different. We were both pretty shocked by Papa Murphy’s. Getting the pizza out of the store was pretty quick and it’s not priced too bad. We really liked that they have a thin crust and the cooking it yourself thing wasn’t as bad as we thought it would be either. It’s like grabbing a frozen pizza from the grocery store, but much fresher and a lot tastier.